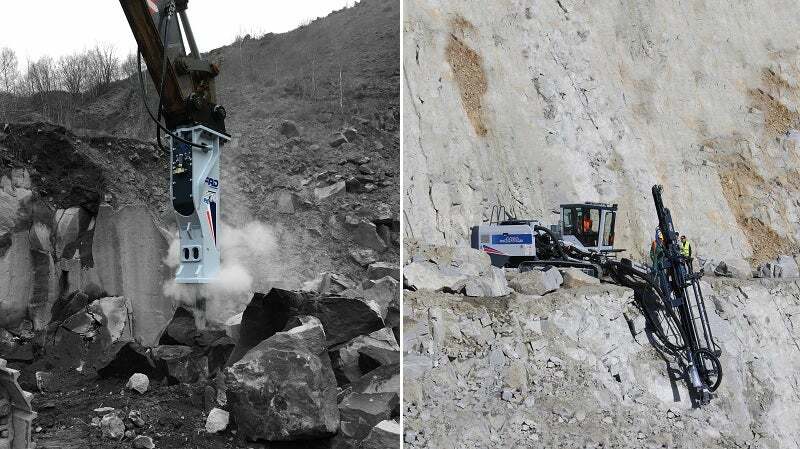 Furukawa Rockdrill (FRD) Europe is responsible for the sale and support of hydraulic and pneumatic surface crawler drills, hydraulic breakers and attachments for the construction and mining industries. FRD Europe is a wholly owned subsidiary of Furukawa Rockdrill Japan. FRD’s premium products are designed to address the tough demands of customers worldwide. The company is dedicated to high-quality, long-life and ultra-reliable hydraulic drilling and demolition equipment, primarily breakers, crawler drills and attachments, are used in over a hundred countries. FRD’s network of distributors is supported by top-quality hardware, constant training, and high-quality customer service. The philosophy of the company is built upon creating long-term relationships that are in turn supported and nurtured by providing clients with what they need in all ways and at all times. FRD surface crawler drills are available in tophammer and down-the-hole configurations. Tophammer machines are designed for holes ranging from 64mm up to 140mm, at hole depths of up to 33m. Drifter power ranges from 14.2kW to 28kW. Down-the-hole drilling is available for hole sizes from 89mm to 165mm, and hole depths of up to 40m. Options are available for a variety of drilling and environmental conditions, as well as accuracy of drilling and data acquisition needs. All machines are designed to comply with safety, environmental and health requirements. Hydraulic impact breakers start from an operating weight of 69kg, all the way up to 6,500kg, suitable for excavators starting from as small as 0.5t, up to 100t. This includes the FXj series, which has mono-block cylinders that improve reliability and reduce running costs. Various configurations are available for all excavators, including backhoe loaders. They also come with various types of frames for different needs, such as standard, silent and extra-silent frames. FRD ensures a top level of performance, durability and reliability in its products. Through years of experience, the company’s designers have developed products that deliver a consistently high level of performance, even after several years of service. The company’s head office is based in Utrecht, the Netherlands, and includes offices, a warehouse and an assembly workshop. All FRD crawler drills come completely manufactured and assembled from one of three FRD factories in Japan. Hydraulic breakers are partially assembled in Netherlands and hydraulic attachments are sourced from a European partner. FRD Europe, in partnership with our dealer network, has performed demonstrations with HCR1400-ED, HCR1450-ED and HCR1600-ED models across Europe during the last 24 months. Furukawa Rock Drill division has built an international sales and service network, which secures an optimum after-sales service for all equipment. Power in your hands. An upgraded operator cabin where almost everything is controlled means operators are more comfortable while being productive. FRD seeks firstly to supply a product of undoubted integrity. Then back this up with a support network of dedicated. Distributors to ensure whatever support, wherever and whenever needed. The three VXB models are designed for excavators from 2t to 13t operating weight. Compact design, large jaw opening and high crushing power are just three outstanding features of this series. Behind their simple exterior FRD breakers hide many years of experience, careful learning and intelligent design. There are hundreds of reasons to let FRD products do your work, here are just some of them. FRD scrap shears are used for demolition of complete steel constructions as well as for reducing on the ground in foundries, garbage dumps and waste recycling.